Today we announced that the Salsify Product Content Management (PCM) Platform now features new capabilities for retailers that enable unprecedented collaboration with brand manufacturers. For the first time, retailers can use our platform to bridge the gap with their suppliers and drive efficient and continuous product content improvement at scale. This helps retailers provide the differentiated digital shopping experience that has become increasingly important to winning sales in today's distributed commerce world. In the age of the consumer leading companies are adapting their operations and merchandising strategies to meeting customer demands on the digital screen. Fact is, $0.56 of every dollar spent in a store is influenced by a digital interaction. Since the advent of online shopping retailers have struggled to source high quality content from all of their suppliers for every SKU they sell. Prior to today, the solution was a manual exchange of spreadsheets with little transparency for brands which often leads to redundancy and errors. 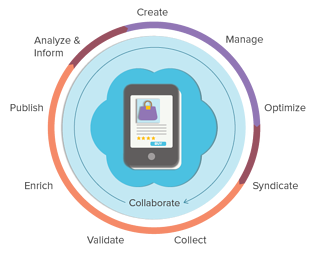 Our platform's new functionalities help solve this problem at scale by giving retailers the ability to power the entire Product Content Management Lifecycle, so they can easily and efficiently collect data from multiple sources, validate and enrich it for a unique customer experience, and publish the content they need for each endpoint. In addition, they can provide performance data and recommendations to suppliers to drive content improvement with every refresh to drive and increased sales. Faster speed time to market with dedicated supplier accounts: Retailers can give every supplier they work with a dedicated Salsify account with all requirements built in and the ability to create, validate, and submit product content for each SKU. Better data quality with schema creation and validation: Retailers can define product content requirements for each category and create validation rules for supplier content submissions and other third party data. Interactive content review: Merchandising teams can easily view, comment on, and approve or reject product content submitted by each supplier in a single environment for suppliers to see and react to. Content performance metrics. Retailers can easily share insights on how supplier content performs, and how to improve that performance for the next content refresh. Watch a 3-minute demonstration video of how Salsify's Product Content Management Platform works for retailers. We'll be providing in-person demos of the expanded platform in Booth 7086 at Shop.Org: Retail’s Digital Summit on September 26-28 in Dallas. Stop by the booth or click here to set up a demo. Not going to Shop.org? Learn more about the retail capabilities of our platform and contact us for a personal demonstration.